New album "Solar Nights" coming April 26th 2019! Formed in 2012 Satin Jackets is the brainchild of German producer Tim Bernhardt. Having enjoyed success through the late 90s and 00s producing house music under a variety of different aliases, Tim launched Satin Jackets as a vehicle to finally explore his lifelong love of disco. The result was ‘You Make Me Feel Good’, a sublimely laidback slice of Balearic House that introduced Satin Jackets to the world. Released on storied Belgian label Eskimo Recordings, who had previously helped launch the careers of artists like Aeroplane and Lindstrom, the single quickly established Tim as one to watch amongst the thriving nu-disco scene. Following on from this auspicious debut a string of acclaimed singles, and remixes for some of the genre’s biggest names including Goldroom and Blank & Jones, would regularly emerge from Tim’s remote forest studio. 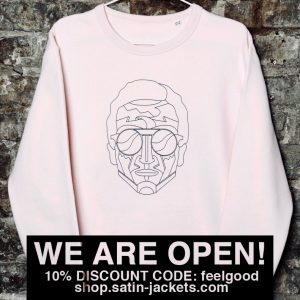 Whilst the face behind Satin Jackets may have remained a mystery his warm sound was fast becoming very familiar to music lovers around the world. Firmly established as one of Eskimo’s flagship artists Tim would define the Satin Jackets’ sound with his debut album ‘Panorama Pacifico’ in 2016. Featuring collaborations with artists including Scavenger Hunt, NTEIBINT and Marble Sounds the album won praise from the likes of Mixmag, DJ Mag and Groove, led to gigs around the world and to date has been streamed on Spotify more than 30 million times. Never one to rest on his laurels though Tim has continued to refine the Satin Jackets’ sound. Following the success of ‘Panorama Pacifico’ he’s steadily built up a close-knit family of collaborators including British singers David Harks and Emma Brammer and US vocalist Niya Wells, and continued to go from strength to strength with singles such as ‘Northern Lights’ and ‘Mirage’ all clocking up millions of plays. From wanting to recreate the sound of magazine covers to appearing on them, the past few years has been quite some journey for the still enigmatic producer, but despite the ever-growing army of fans from every corner of the world Tim remains grounded. Hidden away in the unlikely surroundings of one of Germany’s ancient forests, out of sight but fully in control, Tim is producing music that reflects the glamour and glitz of 70s Manhattan, artfully updated for the 21st century.